9:33 PM Posted by Tony A. 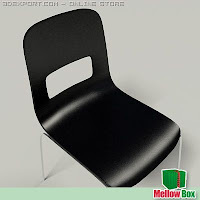 Contemporary stackable chair. Object is made of quads with emphasis on correct topology. Poly count can be easily changed by adjusting the meshsmooth modifier iterations. Poly count with meshsmooth iterations set on 0 is 1240.